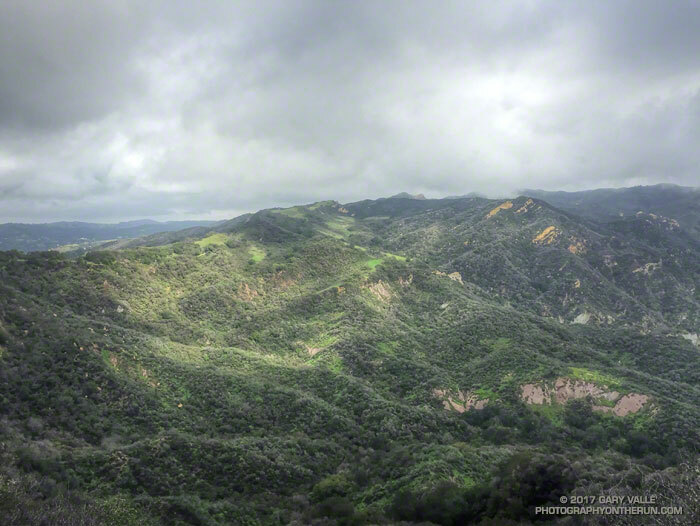 Colors enriched by the early morning light and recent rain, this view of the Santa Monica Mountains is from “Cathedral Rocks,” near the Hub in Topanga State Park. The rock formation in the distance is Eagle Rock. 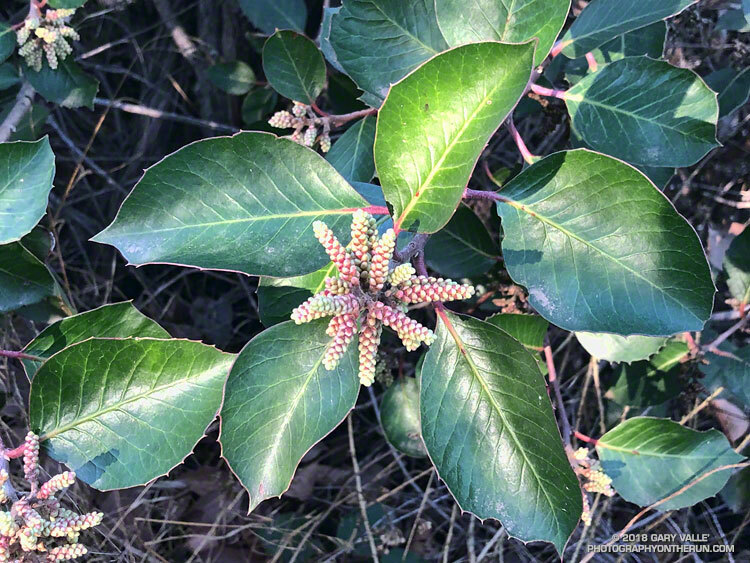 Sugar bush (Rhus ovata) along the Garapito Trail in Topanga State Park. January 13, 2018. 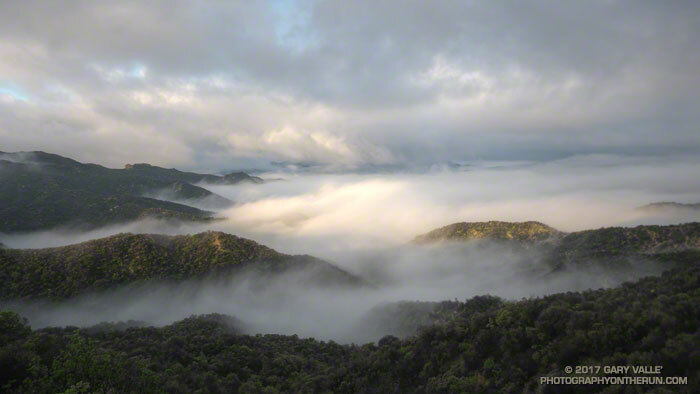 The first rays of sunlight illuminate the ridgetops, fog and clouds in the Santa Monica Mountains, following an overnight rainstorm. From Saturday’s run to Temescal Peak and through a very wet Garapito Canyon. When I emerged from Garapito Canyon my shoes, socks, shorts and shirt were soaking wet. A group of hikers were nearby and one asked if it rained while I was down in the canyon. It hadn’t, but it might as well have. 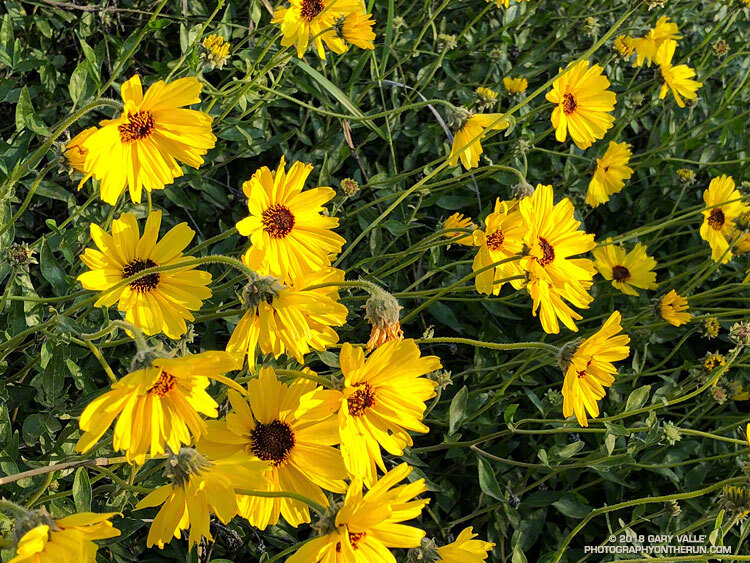 Our wetter than normal rain season has produced a lush crop of annual grasses — some as tall as waist high — that have overgrown sections of many local trails. Water droplets on the feathery styles of Chaparral Clematis. 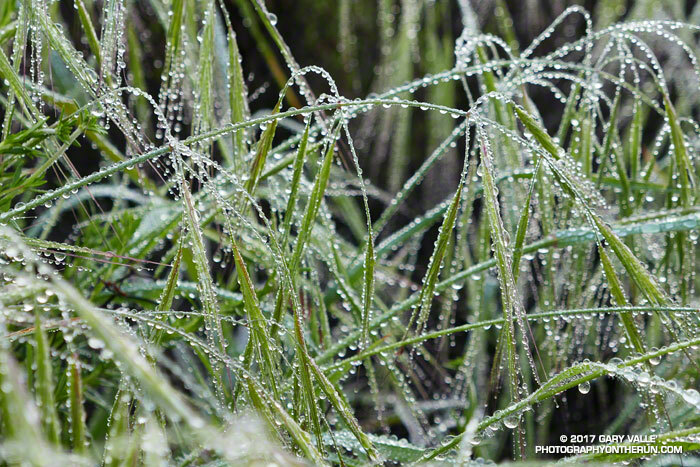 Overnight, light rain had coated every blade of grass and every leaf and limb of brush along the Garapito Trail with water droplets. Running through the wet grass was like passing through the wet brushes of a refrigerated car wash. I happened to be wearing Gortex-lined running shoes, which was laughable considering the amount of water that had run down my legs and into the shoes. They were just as wet as if I had waded through a creek. Well-fitting gaiters might have helped, and at least would have kept the foxtails out of my saturated socks. 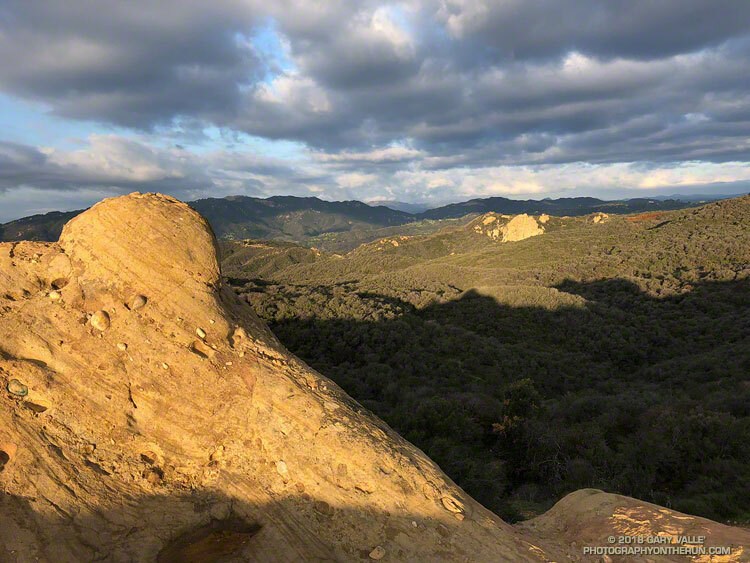 View of upper Santa Ynez Canyon and the Eagle Rock area of Topanga State Park from East Topanga Fire Road. From today’s run from the Top of Reseda to the Los Liones Trailhead and back.